A Kiki is a party that is held for the exclusive purpose of calming the nerves, reducing anxiety and warding off ennui. Of course, the main elements to achieve that purpose are the presence of good friends and good music to set the mood. The mercury's dipping, the political scenario is heating up, and the end-of-the-year blahs are piling up, along with last-minute deadlines. And what happens when nerves start to get frazzled? An explosion of parties and get-togethers all through the month! While this is all wonderful, it gets progressively harder to keep your look fresh without stretching the wallet. The good news is, it is totally possible to rock a different outfit at each event without compromising your budget. All you need are the right accessories, and you can wear one piece in different ways. We'll show you how. Winter is the season to celebrate. It's party, party every weekend and each is a dress-to-impress occasion. Finding it hard to keep track of what to wear and how to make that face up with so many occasions? 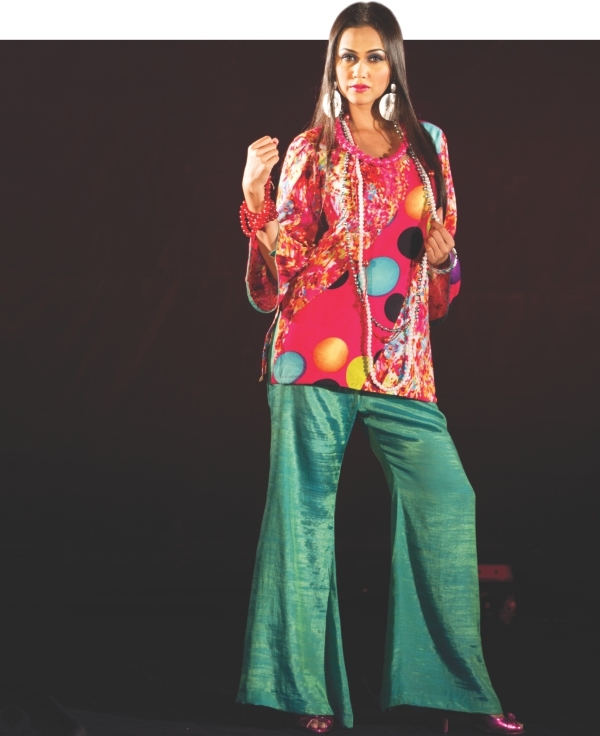 Here is Farzana Shakil's mantra for this season's makeup -- simple, neat and up-beat. Putting on foundation, perhaps the easiest part of applying makeup can be the trickiest as well. Foundations come in many shades and very many textures, from oily to dry to even mousse-like. The latest party trick is to apply foundation which is as close to your natural skin tone as possible. It's about lending your face freshness rather than fairness. The second major choice you need to make is about the kind and colour of blush to be used. Blush is important, very important indeed. It gives your face the contour or it can lift your facial expression and energy. If you are fair and have a sharp face, use a light pink blush to add character to the face and if you are of warmer tone or have a rounder face, use a darker blush to enhance the bone structures. Blush is an amazing tool. The simplest way to look ready is to brush on some blush and coat the lashes with a heavy layer of mascara and you are good to go. It has been the era of killer eyes for the past few years with bold lines and bright colours. Now it is time to be enchanting. Explore the mystery of subtlety with a more soft and blended eye makeup topped off with a pale, soft shimmer. You can enhance the mystique by going for contrast. Think soft orange eyes with a blue attire! As for liners, experiment! Play with colour liners or glitter liners but of course use your judgement to stay glam and not get gaudy. Make the liner prominent and while you are at it use a bit of the liner or a black shade to make the eyebrows dark and prominent. Be generous with the mascara as well. There is nothing more enticing and entrancing than heavy and long lashes. The lip is now the most important dress-up tool in the whole face and hence deserves a lot of attention. Pretty it up with a strong and bold colour like orange, mauve or magenta. It might sound crazy on paper but it looks great on the lips. A good conclusion to your night time party makeup is to sprinkle a little bit of shimmer on the face; makes your appearance radiant and vibrant. An interesting change in style has also occurred on the top of the head. Hair sprays be gone! Its time to let the hair loose and bind them with only clips and puffs to create a comfortable and approachable look. A flashback from the 90s may be a fun as well as elegant look to try this season. Armed with these expert bits of advice you may now set off to conquer this season of parties. 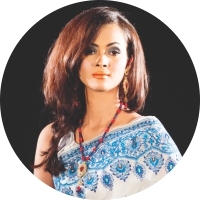 The Bangladesh make-up scene has been determinedly slow in evolving over the long run. We still splatter a layer of white, unnatural looking foundation whereas the rest of the world is learning to look good in their own skin colour. We still put on obscenely pink blush which does nothing to shape our face but instead makes us look like plastic mannequins and we still load our eyelids with colours in-sync with our attires; red for red, blue for blue. This trend of overdoing make-up has made some shun make-up all together but there is a balance in between. Here are some tips for making brown eyes pop, which are appropriate for everyday outings and for professional setting as well. A very old trick which is underused in this part of the world is using a highlighter on the inside lower lash line to make the eyes appear bigger. This is time efficient and can be done without much precision since any non-uniformity in applying the highlighter remains undisclosed and behind the lash. The highlighter also adds a dash of freshness to your look, hence helping you look energetic in the workplace. Another trick to keep it suave yet not be bland is trying some different shades of eye shadows which should not, I repeat not, be in-sync with the colour of your attire. It is wise to learn to treat your eyes as a different entity altogether, not one that comes with your clothes! A vibrant blue shadow is a handy colour for rich, dark brown eyes. It gives the eye some character but does not stand out and hence is office appropriate. Green is another colour which can make the eyes look 'pretty'. Try on different shades of green, different textures and different finishes. Green with brown is a natural blend and hence unless you intentionally want the eyes to scream out, greens will keep the eyes sophisticated. Copper is of course another must-have colour in your office handbag. With copper, however, you might need to get a bit more creative otherwise it might start to look drab. You can warm up a neutral shadow shade, like deep purple or taupe, with a layer of copper shadow on the outer halves of your lids. This will give your eyes the perfect emphasis for a casual day out. The final magic colour for those subtle yet sophisticated eyes is navy blue. Both shadows and liners of navy are the best bet for daytime. It animates brown eyes without looking as severe as black does and gives you office-appropriate cat eyes. It helps creates that slight but eye-catching contrast that every office going young woman is looking for.